Wow you really know how to do it up for the occasion! How wonderful to have a meal in this place! Love the Memorial Day decorations! 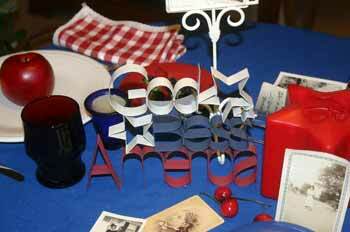 Especially the God Bless American Centerpiece. Great tablescape — and it seems to have spilled over the entire cottage! Looks great! Love all the red, white and blue. Great tribute. That pie has me salivating! Love the photos on the table! The cottage looks very festive. Thanks for sharing and have a great day! Love this. The window with the red (I think ) tablecloth is yummy! 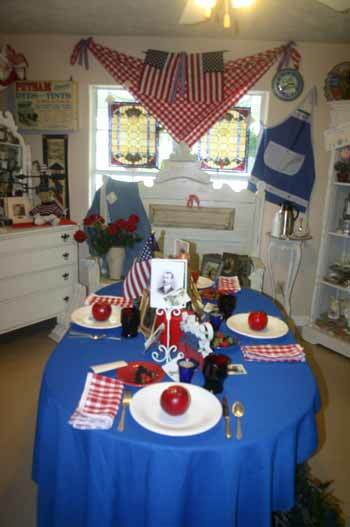 Great ideas for the upcoming 4th of July dinner! I love the pictures of family members. What a wonderful tribute. It’s a beautiful table and charming cottage! 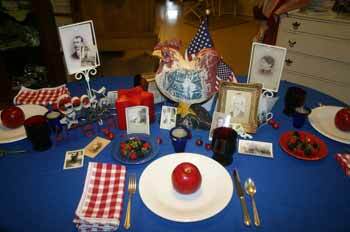 Lovely Memorial Day decor and table! The colors are great and patriotic! 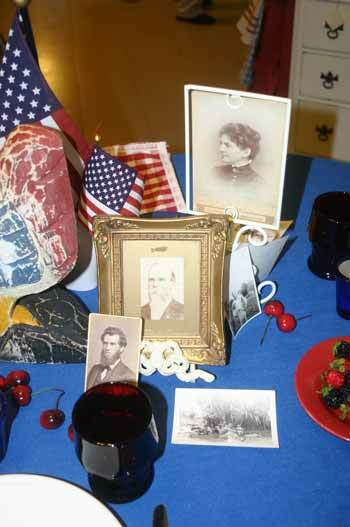 Your room setting and tablescape is a wonderful and beautiful tribute for Memorial Day. Thank your for sharing this. I trust your Memorial Day weekend was also wonderful. Thanks so much for visitng my blog and leaving a lovely comment. 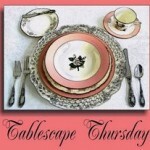 I love your tablescape. The pictures are the perfect touch. I had never thought of using some of my old pictures on my table. 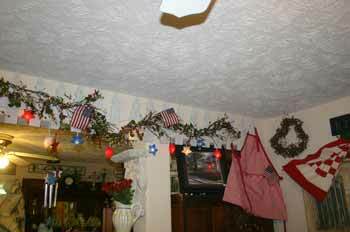 Christi, the cottage looks so wonderful all decked out for Memorial Day. I know your celebration was wonderful. The military photos give the decorations so much meaning. Would you believe I have that same strawberry pie recipe. I haven’t made it in years. It is about time I did. Big smile. Our day in Rocky Mountain National Park was amazing. 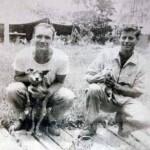 I am showing some photos tomorrow on my post. Thank you for your visit and comments. I appreciate it so much.